All of us have wondered at one time or another why it is that we are asked to sign a document rather than simply applying an inked fingerprint to the paper as a method of identification. Wouldn’t it be just as simple to place a thumbprint on a check instead of a maker’s signature? Would not that foil forgeries? The argument that a signature is easier to read is invalid, as many signatures have evolved until they are nothing more than symbolic representations of what was at one time handwriting and are now unreadable. The answer to this riddle lies in the word “intent.” By placing a signature on a document we are implying intent on our part to agree with circumstances provided by that check, codicil, agreement, contract, etc. One could easily place the fingerprint of someone recently deceased or unconscious upon a document if that was all that was required for authentication. This does not presuppose however, that the placement of an inked thumbprint next to a maker’s signature on a check, about to be negotiated at a check cashing counter in a grocery store, would not be a help. The fingerprint’s universal connotation would certainly, at the very least, be a deterrent to the individual intent upon passing a forged instrument. The development, and examination, of a personal signature follows almost all of the concepts relating to handwriting. A signature may be nothing more than an extension of one’s normal cursive handwriting, or it may have been personalized to such an extent that it now has few, if any, recognizable letter formations. Signatures examined by the forensic document examiner for authenticity will eventually be categorized as genuine, or not genuine, if the examination leads to a definitive opinion. “Forgery” in a strict sense is a legal term and it’s use as a conclusion should probably be avoided by the questioned document examiner. Often a signature in of itself may be valid, but the manner in which it has been acquired or affixed to the document, or the sequence of events involved in its use are fraudulent. The product of a rubber stamp or autopen is certainly not a genuine signature but is most frequently used in a previously authorized capacity. While these signatures are not genuine, they are undeniably not forgeries. Terms such as “Forgery” and “Fraud” are perhaps best used by the legal community. Having said that, the reader may find that these terms are occasionally used in a descriptive manner throughout this text. By definition, a genuine signature is the personal mark of an individual, written by that individual.  It normally serves to indicate his or her acceptance of some set of circumstances, or to be the symbol associated with such an agreement. Keeping this definition in mind, we can discuss those other “signatures” that are not genuine. The forger places the pen point in contact with the paper, and then starts writing. When he is finished with the name or some portion thereof, he stops the pen and lifts it from the surface. This may cause an emphasized blunt start or ending where the pen was placed in contact with the surface. At times this contact is held so long that if the pen contains a fluid ink it will wet the paper and migrate outward from the contact point or even through to the back of the paper. There may be unnecessary and extraneous marks caused by pen starts and stops. The writer may decide after putting his pen in contact with the paper, that it is in the wrong spot, picks it up and moves it to a position considered more correct. Normally a signature’s starts and stops are much more dynamic. The pen is moving horizontally before it contacts the paper and is lifted at the end while still in flight. This leaves a tapered appearance at the beginnings and endings of names or letters. There are, of course, exceptions to this. This is occasioned when the pen stops at an unusual point in the writing; perhaps where a radical change in direction is about to take place or a new letter formation is about to be started. This may take on the appearance of a small gap in the written line where one is not expected, or an overlapping of two ink lines where there should be only one continuous line. Because the creation of most forms of non-genuine signatures are little more than drawings, the pen is moving so slowly that small, sometimes microscopic changes in direction take place in what should be a fluid-looking line. The resultant line is not smooth, but reflects the “shaking” pen. Again, because the pen is moving slowly rather than with the dynamic movement associated with most genuine writings, the ink line remains constant in thickness, resulting from the same constant pressure exerted on a slowly moving pen. There will be little, if any, tapering of internal lines. Infrequently, but at one time or another, most of us have made an error while writing our own signature. Some individuals may leave the signature alone, caring little about the mistake or imperfection, while others will simply “fix” the signature by correcting the offending portion. This may be done in order to make the signature more readable, or because a defect in the pen or paper has affected what we perceive to be our “normal” signature, or for some other reason that may even be subconscious. These “fixes” are usually patent, with no attempt made on the part of the writer to mask or otherwise hide the correction. These signature corrections are quite different than the patching that is frequently found in non-genuine signatures. On these occasions, the writer is not attempting to make the signature more readable, but to make its appearance passable. He is fixing an obvious defect that he perceives as detectable, and might uncover his fraudulent product and foil his scheme. These usually take the form of a correction to a flaw in the writing line rather than in the form of a letter. Extensions to entry or terminal strokes, or to lower descending portions of letters, along with corrections to embellishments, are typical of non-genuine patching. There are times when some of these same forgery indicators will be displayed in genuine signatures. Aged or infirmed writers will frequently display similar patterns. The mere presence of these indicators does not mean that the signature under scrutiny is non-genuine, but should contribute to the overall determination as to genuineness. Alternately, the signature devoid of these indications may not be assumed to be genuine. The signature of an elderly individual may, for instance, be expected to contain tremor and hesitation. 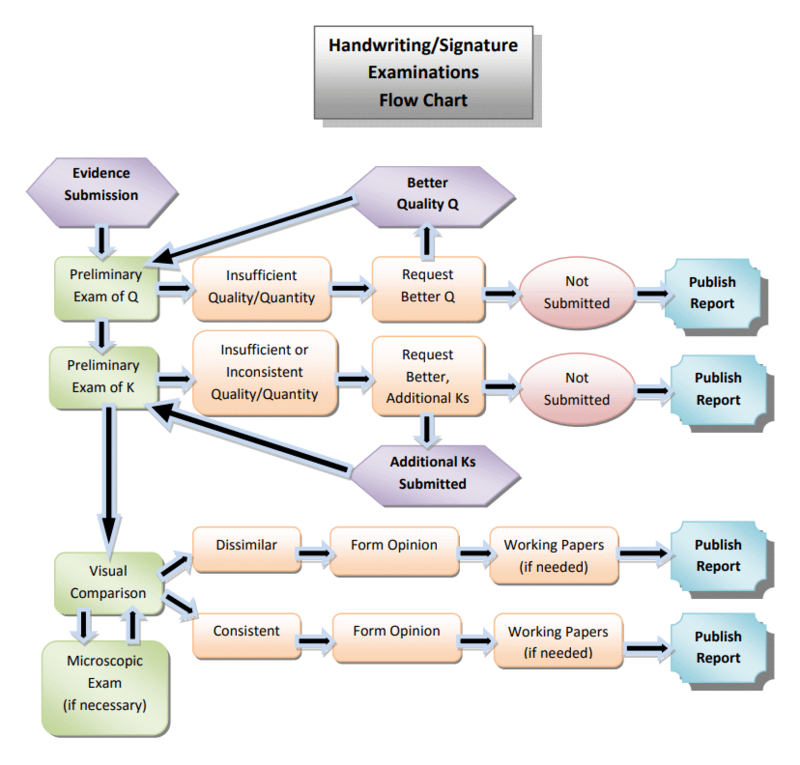 If, however, the questioned signature appears to be written in a fluid manner and/or on a higher skill level than what is expected, the red warning flag should be waving. This occurrence may itself be indicative of non-genuineness. Often, a forger, because of an inherent high skill level in his writing, may produce a product that contains fewer indications of forgery than a counterpart with a lower skill-level. Non-genuine handwritten signatures may be generally categorized into one of four possibilities. While a determination of forgery may be possible, it is not always possible to assign the signature to one of these categories. It may, however, be prudent for the document examiner to do so when possible as the demonstration of non-genuineness may be much more effective. During the creation of this class of non-genuine signature, the writer simply writes someone else’s name. There is no attempt made to duplicate or make the forgery look like a genuine signature. Any resemblance to the genuine signature is coincidental. Usually, the perpetrator of this signature does not have a model signature at hand and/or the skill level or forethought to attempt an emulation. If he does not attempt to impart disguise to the writing, the resultant product will display characteristics of the forger’s own handwriting. Armed with adequate standards of both the individual whose name is being used and exemplars of the suspect, the document examination may be definitive to the point that not only is the signature declared not genuine, but the forger is also identified. The simulated signature, or “free hand forgery” as it is sometime known, is the usual bill of fare for the questioned document examiner. This forgery is constructed by using a genuine signature as a model. The forger generates an artistic reproduction of this model. Depending on his skill and amount of practice, the simulation may be quite good and bear remarkable pictorial similarity to the genuine signature. Many simulations created with a model at hand will contain at least some of the general indicators of forgery, such as tremor, hesitation, pen lifts, blunt starts and stops, patching, and static pressure. They will have a slow “drawn” appearance. The practiced simulation is most often a higher quality creation in that the model signature has been memorized and some of the movements used to produce it have become semi-automatic. This simulation can be written with a more natural fluid manner. There can be tapered starts and stops, changes in pen pressure, and much less tremor in the moving line. Speed lends fluidity to writing. The more rapidly the pen moves while creating the genuine writing or signature, the more difficult the genuine writing is to imitate. Rapidly formed movements are scrutinized more closely than slower counterparts. A slowly written signature is not only easier for the forger to duplicate with some fashionable degree of pictorial similarity, the product will also display indications of non-genuineness than the forgery of a rapid and fluidly executed signature. The writer of a simulation must, of necessity, pay more attention to the form of a letter than the speed of his pen. Both practiced and non-practiced simulations will still have notable shortcomings. The forger naturally puts his greatest effort into those parts of the name that he expects to fall under the greatest scrutiny. Although letter forms (especially the more prominent, large or beginning letters) may almost duplicate the genuine letters, proportions and height ratios will seldom be correct. Internal portions of the names (smaller, less prominent letters and pen movements) will usually display the greatest divergence from the correct form and movements found in the genuine signature. While the simulated signature will readily fail the test for genuineness when examined by a competent forensic document examiner, the forger is rarely, if ever, associated with the forgery. During the creation of a simulated forgery, the author attempts to duplicate the writing style of another individual. By doing this, the forger leaves behind little, if any, of his own distinctive writing style. By doing an emulation of someone else’s signature, he also produces one of the best of all possible disguises of his own handwriting. Infrequently, some of the forger’s own individual characteristics may appear in the disputed writing. The limited quantity of these characteristics which appear on those occasions is such that identification of the author almost never occurs. On some occasions, a “practice sheet” will be recovered by the investigator. Herein lies the best opportunity for the document examiner to link the suspect to the simulation. If there was an eye witness to the subject writing on the practice sheet, or if it was found in his close possession, it may be used as a standard. (This is, of course, dependant ultimately upon court acceptance over what will undoubtedly be rigorous objections). If there are a sufficient number of significant differences between the questioned signature and the genuine signatures, and these same differences appear in the practiced simulations, there may be a basis to associate the forgery to the forger within some degree of probability. An absolute identification, nonetheless, even under these circumstances is infrequent. Closely related to this form of identification process is that of determining the number of different forgers from a quantity of simulations. On occasion there will be two or more forgers attempting to reproduce the same signature. It may be possible to group or associate simulations of the same name by the combinations of defects within the forgeries. By associating and grouping the similar defects (when compared to the genuine signature) it may be possible to conclude and illustrate that there are indeed, two or more different forgers. Traced forgeries are generally created by one of three methods: “transmitted light,” “carbon intermediate,” or “pressure indented image.” While tracings may not normally present much of a challenge to the document examiner trying to determine genuineness, the ability to identify the perpetrator is totally precluded. Tracing another’s signature, or for that matter another’s handwriting, is the paramount form of disguise. Total agreement between the model and the questioned signature dictate that the questioned signature was a product of tracing. No two signatures or handwritings, even from the same person are ever totally duplicated. Just as certainly, total agreement between two, three or more questioned signatures is adequate demonstrative proof of tracing. Of course, the document examiner faced with total agreement between a number of signatures must take care that the model signature (genuine signature) is not one of the signatures in question. The model signature, if recovered, may of itself contain evidence of its use in producing a tracing. A second ink line or indentation impressed into the genuine signature by stylus or pen or other pointed implement is usually indicative of a pressure or carbon tracing. Again, caution must be exercised if a second ink line is present in a genuine signature. The immediate assumption by the uninitiated examiner that this signature is itself a carbon-type tracing can be a source of error. On occasion, signatures that were executed while the writing paper was on a rough surface (matte finish) contain the illusion of tremor created by simulation or tracing. Close examination will reveal that this tremor is much too abundant and evenly spaced. There will be little, if any, variation in the tremor and the peaks and valleys of the rough surface will be embossed into the written line. The transmitted light tracing is the simplest of the tracings to produce and the one most often encountered. The paper that is to receive the spurious signature is placed over a document bearing the genuine signature. These documents are then aligned so as to put the genuine signature directly under the selected location for the forgery. These two papers are then held up to a window or other light source, and the transmitted signature image is traced on the receiving document. The indicators of a transmitted light tracing are similar to that of a simulation and the two are difficult to tell apart (unless the model for the tracing is located). Height ratios and proportions in the transmitted light tracing are generally right on the money, however. These two features are frequently incorrect in the simulation. At times, a carbon-medium tracing is the method of choice, especially if the document to receive the tracing is too heavy a weight, such as cardboard, to allow for a good light transmitted image. Normally, the area to receive the signature is covered with a piece of carbon paper which in turn has the model signature placed upon it and aligned with the area that is to receive the image. The model signature is then traced over with a pen or other pointed implement. This procedure will impart a carbon image of the signature on the receiving document. This image is then overwritten with a pen. Often this pen will be a broad-tipped instrument such as a felt-tip or fountain pen. This wider ink line serves to hide the carbon image better than a ballpoint pen. Some “paperhangers” employ a light carbon tracing, difficult to see even at a short distance, as an endorsement on stolen checks. These checks are then cashed at the financial institution or check-cashing service where the real endorsee has an account. The passer then “endorses” the check, writing over the traced lines in front of the cashier or teller, thereby lending credence to the drama. Again this is most often accomplished with a broad-tipped pen. Quite frequently, the “ghost” line of the carbon impression is not in register with the inked overwriting and a double line is readily apparent. Often microscopic observation and/or infrared viewing or imaging techniques will reveal the carbon centerline. Occasionally, the questioned document examiner is rewarded with the recovery of the used carbon paper. Transparencies of the model signature (if recovered), the impression in the carbon paper and the tracing, when aligned on an overhead projector make for an effective court demonstration. Now and then, the examiner will come across a derivation of this style of tracing that does not use carbon paper. Using a soft-lead pencil, the reverse side of the paper containing the model signature can be shaded with the pencil’s graphite point. This soft graphite will then be transferred to the receiving document in much the same manner as if carbon paper was utilized. The mere existence of a ghost line may not guarantee that the signature in question is a tracing, however. On rare occasions another force may be at work. Although rarely seen today, some older style photocopying machines rely on a pre-sensitized paper coated with zinc oxide. If this paper bears an original ballpoint signature, there may be a ghost image, or what appears to be a guideline consistently on either the right side or less frequently, on the left side or the original ink. This ghost image (also referred to as sister lines), will be precisely the same distance from the corresponding original ink line throughout the writing. It may not be continuous, but appear only in conjunction with specific letters. This illusion of tracing is generated by the abrasion of the pen’s metal ballpoint socket by the harder material of the paper’s zinc oxide coating. This will occur in pens that have fairly broad ball housings, rather than steeply angled sockets. The material of the socket must be made of a sufficiently soft metal to allow for the abrasion to occur. Right-handed writers would tend to have the ghost image to the right of the letter formations, while left-handed individuals will likely produce the ghost image on the left side. Because of the almost non-existent use of this sensitized paper in modern day machine copying processes, most document examiners will likely never encounter this problem. However, on occasion a similar phenomenon can be found when NCR (National Cash Register – no carbon required) paper is employed. Similar to a carbon paper tracing, the indented line tracing is produced in essentially the same manner, but does not employ any intermediate reproduction medium. Heavier pressure is used when tracing over the model signature. This pressure leaves an indented “signature” on the receiving document. This is then covered over with a broad-tipped pen, although ballpoint is found on occasion. Almost invariably, the writer misses portions of the indented line. This error may be easily observed using glancing (oblique) light. Other general indications of non-genuineness are similar to those found in simulated forgeries. In both the carbon-medium and indented line tracing, the forger is faced with an paradoxical situation. If he overwrites the model image with enough speed to make the forgery fluid and natural appearing, he will undoubtedly miss the model line in several areas that will then be readily discernable. If, on the other hand, he pays particular attention to covering the model image, the resultant line quality deteriorates into the slow-moving, hesitation-filled byproduct of forgery. On rare occasions, an innovative form of spurious signature may be encountered that can best be equated with a tracing, but in actuality differs from the conventional concepts of tracing because of its method of production. Most traditional ballpoint pen inks employ an ethylene glycol medium as the base ingredient to carry dyes, extenders, plasticizers, and other ink components. A signature made by employing a pen using this ink may be “transferred” to another document by using ordinary waxed paper or freezer paper. By placing this form of medium over a genuine signature and rubbing the top of the paper vigorously, the wax that is in conjunction with the signature will melt and subsequently absorb some of the ethylene glycol-based ink line. This paper now containing a mirror image of the genuine signature is placed over another document that is to receive the forgery. The waxed paper is again rubbed briskly, melting the wax and ink composite. This process will result in a forgery that does not conform to, nor contain, the normal observable conditions that are associated with simulated or traced signatures. This is because, in essence, this signature was created by the signature holder’s hand rather than the forger’s. Indications of this process will be in the form of wax left behind that covers and surrounds the signature line. The signature itself will have a discernibly faded appearance and the edge of the ink line when viewed under low magnification will have a mottled look rather than sharp appearance. The signature that does not satisfy the requirements for genuineness must necessarily be non-genuine. To use an old cliché, anything in between is similar to being slightly pregnant. It matters not how the conception (or in this case, deception) took place. Occasionally, an individual will sign a document with the specific intention of denying the signature at a later time. Some people may think of this as a safeguard when they are confronted with the necessity of signing something they are not sure about, but demands immediate attention. Others start out with larceny in their hearts. These signatures, commonly referred to as auto-forgeries, will usually be found on promissory notes, contracts, Constitutional Rights forms, confessions, closed-account checks, etc. 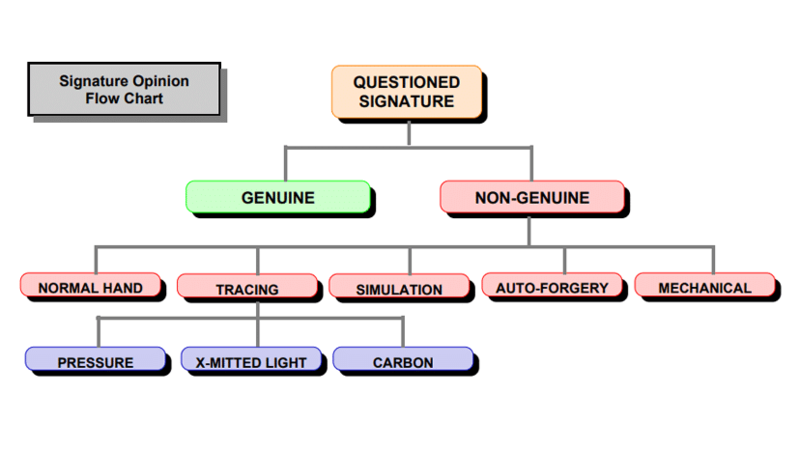 Initial observations of an auto-forgery often appear similar to what might be expected in a simulated forgery. Further inspection will almost always reveal remarkable internal similarities to the genuine signature. Why does this happen? The auto-forger, not knowing the perceptual abilities of someone that might examine the signature, incorporates gross changes to the larger, initial, or prominent letters. His usual response when confronted with a signature that he is denying is “I never make that letter(s) that way.” Indeed he doesn’t, but neither would a real forger. This attention by the writer to changing prominent features usually does not carry over to the small and seemingly less significant letter formations that are found within the interior of the disputed signature. Under close scrutiny, the details present in these less prominent portions of the signature will bear undeniable similarities to that in the genuine signatures. Once the writer has accomplished what in substance is a disguise in the letter formations of highest visibility, he will fall back into his normal habitual handwriting or signature style until such time as he perceives the need for another letter formation alteration. With an auto-forgery, the legal authenticity of the signature may be quite different than that of forensic authenticity. The auto-forgery may at once be legally authentic (especially if witnessed), forensically non-genuine and ethically (if not judicially) contemptuous. Mechanical signatures most often are those produced without the direct aid of the human hand. Signatures produced by auto-pens or writing machines, rubber stamps, and offset printing are examples of mechanical signatures. These imitation signatures differ from other non-genuine signatures in that they may be legally genuine when their use has been authorized by the signature holder. These are prime examples of forensically non-genuine but legally authentic signatures. However, when mechanical signatures are used in non-authorized capacities, they are quite simply forgeries. Rubber stamp signatures used by a secretary to sign company checks for the boss look the same as those produced by a burglar who stole the rubber stamp.